When planning themed events in San Diego, you will come across many venues of all shapes and sizes. These event locations will come with a variety of amenities and distinguishing features. Because of this, you may find it challenging to narrow down the options. Some venues will be well known already, and others will stand out for their uniqueness. Regardless of which venue you choose, it is a good idea to pick an event space that you can make your own. This will lead to an engaging and interactive experience for your guests. A great venue will enhance the theme and bring it to life, and provide an event team who will put their creativity to work for you. So how do you decide on the right venue, given all the options? Fortunately, we have created the following tips and recommendations. These will help you narrow down your perfect venue for themed events. It may not seem important at first, but you will find that the size of the venue makes a significant impact on the potential for carrying out your theme. For example, if you are planning your event at a large chain hotel, it may be difficult to apply your theme throughout the event location, given the number of other events and activities taking place. During your event, you will be sharing the common areas with other groups, and the venue management will likely want the space to remain neutral and not decorated according to your theme. This takes away the potential to apply your theme to the event entrance, where you could otherwise create a dazzling walk-up experience to welcome your guests into the ambiance you have created. Conversely, if your venue is too small, your theme will lack impact. Ex: if you are restricted to the back room of a popular restaurant, you only have one room to carry out your theme, which makes it less of an experience than walking through an entire themed-out venue. Our recommendation is to choose a venue where you have ‘run of house’ for the duration of your event, giving you the ability to create the amazing themed event you are envisioning. When comparing venues for your themed event, we advise leaning towards one that has an in-house event team. This has several advantages. First, the in-house team will already be familiar with all aspects of the event space, and will be able to share ideas without having to first get acquainted with the location. Second, the team will likely have experience planning themed events, and may be able to share specific examples that will be relevant to your event. Third, the team may have creative suggestions and tips that you would not have thought of otherwise, and fun ways to incorporate your theme in greater detail. For example, if the team has connections with a caterer who can create a specialty menu to match your theme, the team will be able to make the first call and set up a meeting for you. Fourth, the event team will help with the event production and logistics, taking a lot of this weight off your shoulders. Even if you have an event planner, or you have personal experience with themed events, it is a good idea to select a location that provides you access to a built-in event team. As you are evaluating different venues, keep in mind that the features and amenities of the venue itself may prompt ideas for your themed event. In fact, you may want to hold off on finalizing your theme until you’ve had a chance to explore the available venues. This way, you won’t wind up limiting the possibilities. Otherwise, you may commit to a specific theme and then find an incredible venue could take your event in an entirely different and better direction. If you have flexibility in your theme, we suggest starting with the venue and taking inspiration from the location itself. Some venues have distinguishing features that make them ideal for themed events. 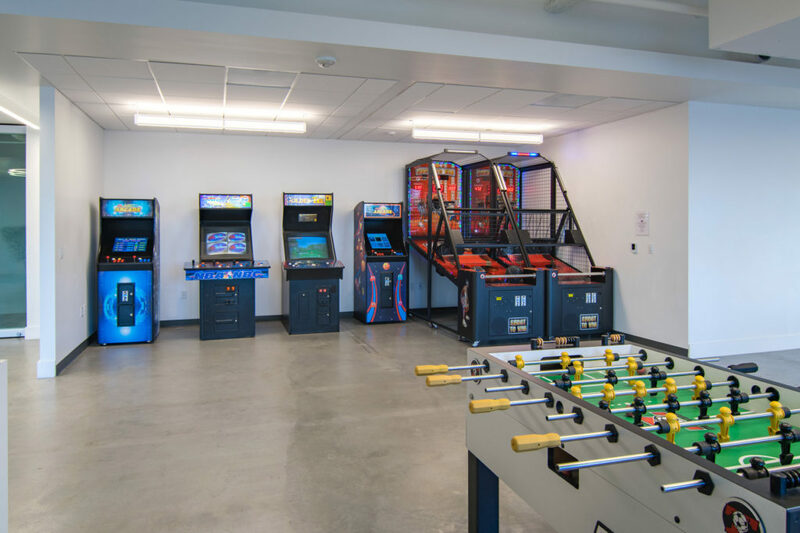 For example, a venue with an onsite arcade would be perfect for an old-fashioned midway carnival theme, or a nostalgic video game party. If the venue has open-air seating, you could arrange an outdoor movie night with popcorn machines and a red carpet entrance. And if the location has a private deck, you could set up tall tables and hire a close-up magician to wow the crowd, along with signature magic-themed cocktails to match. The options are limited only by the venue itself, so be sure to find a venue location that supports your theme and opens up even more possibilities. We hope these recommendations help you to choose the perfect venue for your next themed event here in San Diego. At deck655, we have a very experienced and imaginative team who will help plan all your themed events, and show you why our downtown event venue will be the best location for your upcoming celebration!